LOCATION.--Lat 41°55'31", long 74°32'25" referenced to North American Datum of 1983, Ulster County, NY, Hydrologic Unit 02040104, on left bank at downstream side of bridge on Denning Road, 1.6 mi southwest of Ladleton and 1.9 mi northeast of Claryville. PERIOD OF RECORD.--July 1991 to current year. GAGE.--Water-stage recorder and crest-stage gage. 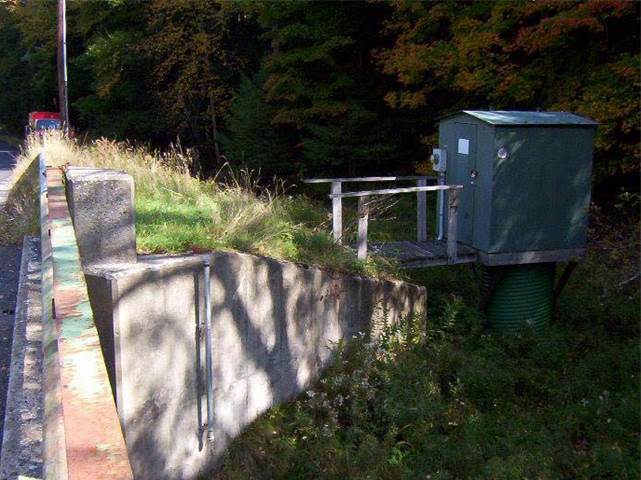 Datum of gage is 1,727.43 ft above NAVD of 1988. EXTREMES FOR PERIOD OF RECORD.--Maximum discharge, 7,650 ft³/s, Aug. 28, 2011, gage height, 13.61 ft, from rating curve extended above 2,700 ft³/s on basis of runoff comparisons with nearby stations; minimum discharge, 4.5 ft³/s, Aug. 12, 2002; minimum gage height, 3.92 ft, Mar. 6, 2012.